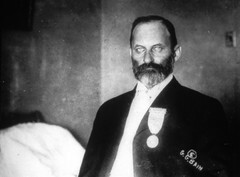 Image of Senator Joseph E. Ransdell of Louisiana. In 1930, convinced that fundamental research could lead to cures for diseases, he got his Ransdell Act through Congress. This Act reorganized and expanded the Hygienic Laboratory and renamed it the National Institute of Health.